Kira is Toli's daughter from her very first litter. 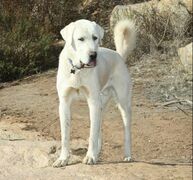 Kira is an absolutely AMAZING dog. Intelligent, devoted, and protective are just a few of the adjectives to describe her. She is absolutely amazing with the goats, even the tiny newborns. Our farm is very blessed to have her protecting us! 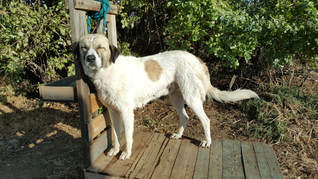 Kira is 3/4 Anatolian and 1/4 LGD Mix (Pyrenees, Ovcharka, Akbash).